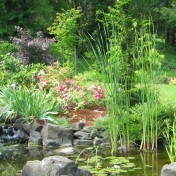 Garden Elements Archives - Ann Nickerson Landscape Design, Inc.
Garden elements include many different hardscapes and structures. 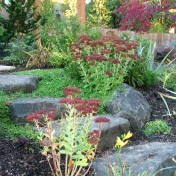 Each should be chosen to enhance the garden and meet the desires needs of the client. 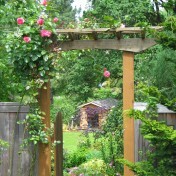 Dear Ann: Thank you again for your coming up with the new, less expensive design--think it will do just every bit as well, too for the clematis. We are now enjoying the last of the beds which were just finished, and I am pleased to have this now accomplished. By the way, the plant I kept referring to as a Penstemon and which I just loved was fountain grass, Orientale and it is now happily up near the front part of the bed near the flag pole. The new rhododendron on the front of the house south bed are now in, too and look so nice. The new pergola will now go in in a couple weeks. Marv and I want you to know how much we appreciate the professional yet personal attention you gave to doing our yard design. 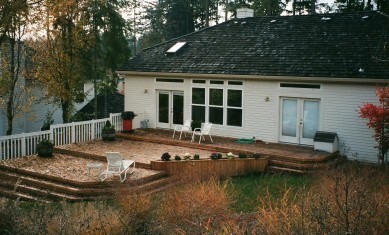 We're very happy with the results and look forward to having a beautiful well planned backyard. Please feel free to use us as a reference. We would highly recommend your services.